Network Resource offers a complete portfolio of expertise in the field of information technology. 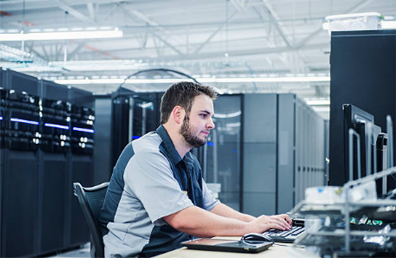 Network Resource consultants are both accomplished IT systems designers and experienced systems administrators. With this background knowledge and experience they possess a blend of skills lending both to big picture planning of process and procedure as well as real world systems implementation and management. Network Resource specializes in several server and workstation platforms. These include Windows, Redhat Enterprise and Macintosh servers, and a variety of accompanying applications. Our specialization in these operating systems helps our customers to refine their competitive edge by providing the highest level of application and connectivity solutions available. We maintain no exclusive vendor relationships but instead remain aware of the product offerings from all major vendors to then determine which combination of offerings best suite our customer's needs. We emphasize the hiring of experienced staff, extensive ongoing training, high staff utilization and immediate, productive deployment of available personnel on client projects. We believe that our company's cost structure and experienced staff allows us to deliver service at a lower cost with quality equivalent to or superior to other larger firms in the industry. Centralized Macintosh workstation management via ARD, Software Update Server, and more. Support for software developers using Xcode. Xgrid, and standard Unix tools. Network Resource brings the same proven approach to our support of open source solutions as we do to our support of proprietary systems such as Windows. By understanding your objectives, we will align our technical solutions to meet your business goals. Our team of consultants and engineers are experienced in all aspects of IT management practices. This experience and expertise ensures that your open source project and support needs are handled in a way that exceeds your expectations.